I have had a really busy day today with starting to make icicles for my winter goddess, complete the background for an ATC and a beaded journal page. also I have spent 15 minutes at a time cleaning up my ipod and deleted over 500 duplicate songs and spent all day listening to the Kings of Leon. Think they will be my band of choice at the moment. Also I have spent time tidying up all my photos from seven years so they are all stored onto a remote hard disk and then hopefully I will be able to get my computer fixed or sorted as I am not able to do anything with adobe files, quicktime or flashplayer so I cannot download any e-books onto my e-reader. 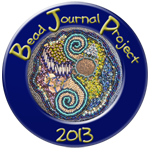 two more days and work starts again so going to spend several hours beading and stitching now and then to bed. Shopping tomorrow for new clothes (since I have a stylist I have discovered a love of nice clothes) and then gardening and house cleaning weather permitting.